As a student manager for James’ soccer team in high school, Angela Toomey has long been his biggest fan. Since they started dating, they have shown endless support for each other and their very favorite hockey team—the Philadelphia Flyers. In fact, it was at a game in Pittsburgh that James proposed to Angela. And their story only gets better. 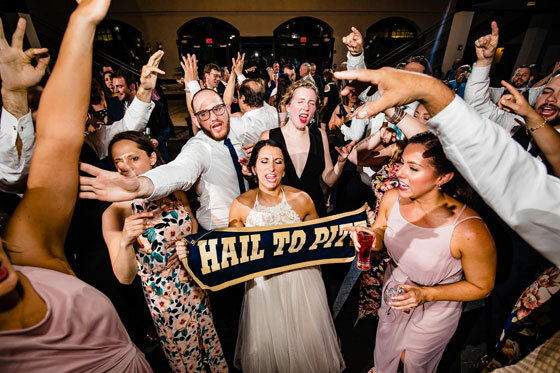 On June 2, with the help of 250 of their closest friends and family, Angela and James’ fun-loving relationship reached new heights at the Phoenixville Foundry. 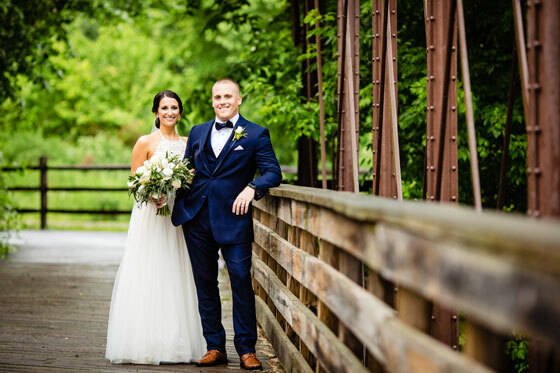 When the bridal party arrived early to Phoenixville Foundry, they were able to capture beautiful photos outside on the Phoenix Truss Bridge and among the historic Phoenix columns. These two sites are one of the many Phoenixville Foundry landmarks that have been the backdrop for some of our favorite wedding photos. 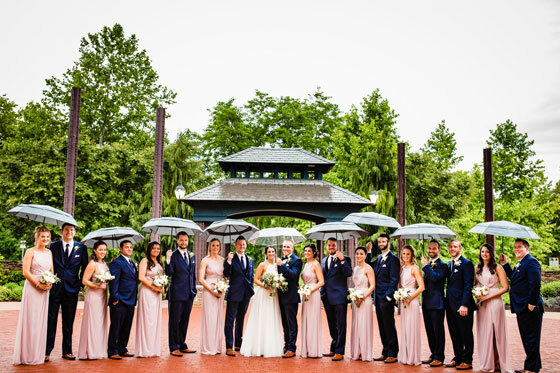 In the magical beauty of these remarkable locations, even the rain didn’t deter the bridal party from laughing and smiling. 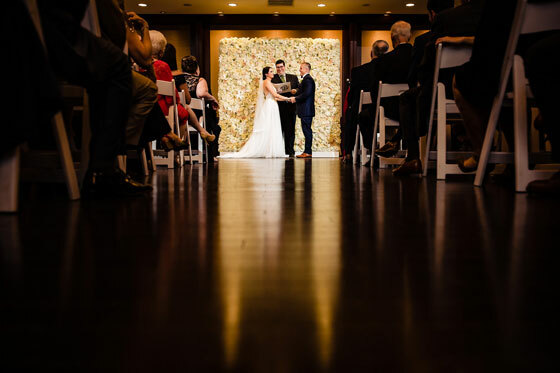 To ensure guests’ comfort, Angela and James opted for a new location for their 5:30pm ceremony space. The dance floor with magnificent flower wall was a fantastic alternative to the always-popular sculpture garden that they had originally intended to use. Guests still got to enjoy their choice of water or iced tea before the ceremony. And, thanks to our experienced staff, flipping the room for the reception was never a concern. At 6:00pm, guests gathered on the first floor mezzanine for an exciting cocktail hour. From the bruschetta wall display to butlered Bud Light (James’ favorite drink) and red/white wine at the top of the stairs, each element of the cocktail hour augmented guests’ excitement and anticipation of the evening. One thing that stood out during the cocktail hour—and would continue to come forth throughout our culinary service—was the fantastic array of gluten-free items. With Angela having this dietary need, our unique offerings allowed her to not miss out on any fresh and flavorful dish. At 6:05pm, when we invited guests down to the dance floor for the reception, they couldn’t wait to see what other tasty and even gluten-free dishes our talented chefs created. 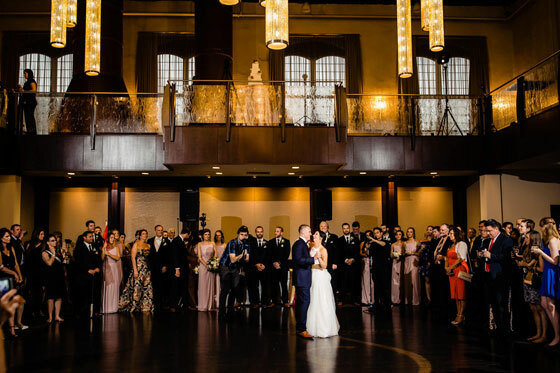 When it was time for introductions to begin, the bridal party could not have asked for a better spotlight—entering via alternating staircases, the bridesmaids and groomsmen took center stage in glamorous fashion. Then it was on to the first dance and parent dances before we invited guests to take their seats in the West Wing, where they were captivated by the striking décor and features of this popular reception space. 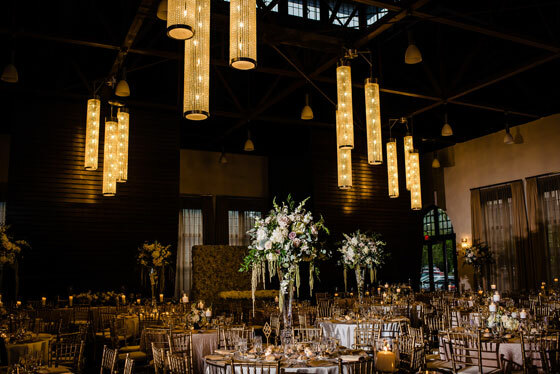 The green, ivory, blush and shiny gold color scheme set a stunning scene that was elevated by magnificent chandeliers, elaborate floral centerpieces and eloquent candles. When the dance floor opened at 8:45pm and a sports banner came out, we knew these guests would need little encouragement to start dancing. And any extra energy they needed they were sure to find at the dessert and coffee stations. After the cake cutting from the mezzanine, guests couldn’t wait to try the beautiful wedding cake by The Master’s Baker. But if they were feeling more like a grab-and-go option, then a great variety of cookies as well as glasses of regular, chocolate and strawberry milk were ready and waiting for them. At 10pm, the fire pits opened and the late-night snacks rolled out. Given Angela and James’ Philly pride, a cheesesteak grill was the perfect choice. Guests loved this satisfying late-night bite that tied the conclusion of their wedding back to their proposal location. Totally customized using a variety of toppings, these made-to-order Philly classics were a huge hit. 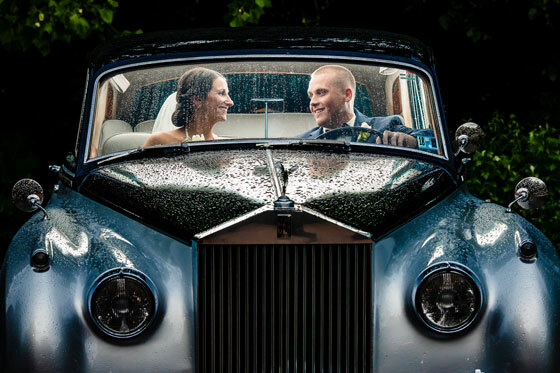 At 11pm, when it was time for Angela and James to head off in an antique car, an impressive fireworks display capped off their memorable wedding celebration. 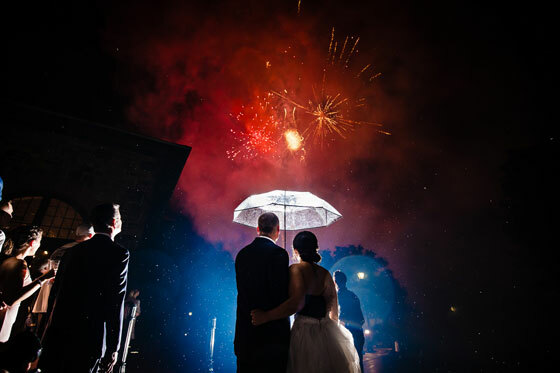 The Simpsons and all their guests will never forget this sight or any of the other tremendous ones they enjoyed at this Phoenixville Foundry wedding. If you would like our culinary experts to design your delicious custom menu to be delivered on time and on budget to your Philadelphia wedding venue of choice, contact our experienced team online or give us a call at 610.725.9420.